Rockville lead the way in the Murphy’s Stout AUL Premier League campaign. But it is a campaign that has hardly started. 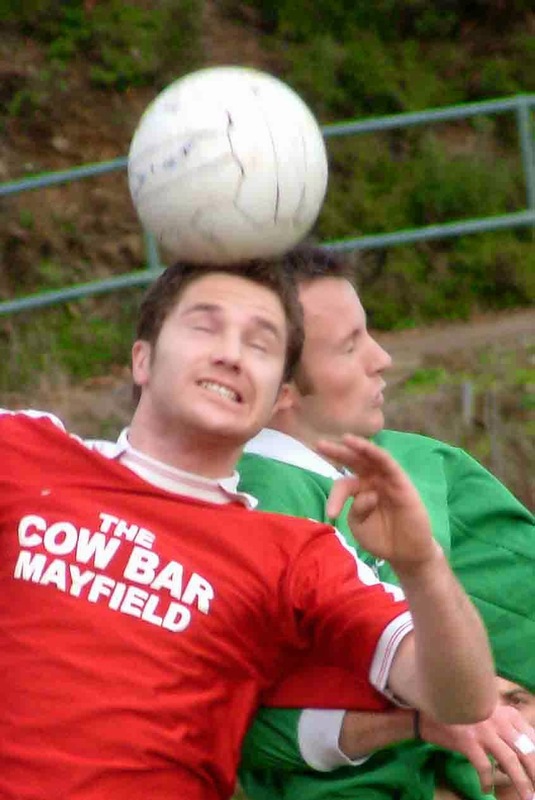 Big guns Leeside, Maymount Celtic and Greenmount Rangers have played just a handful of games between them while Kinsale, champions for the past two seasons, haven’t played a league game yet. One thing is pretty clear: Kinsale’s main opposition will come from the three already mentioned though Village will cause problems. Also clear is that Grattan, without a win in six, have a major battle on their hands to avoid relegation. Cup runs are again the problem for the big teams and the schedules of Kinsale and Greenmount were further complicated by their run to the final of the Linnane League Cup where Greenmount emerged victorious on the night to claim the first junior silverware of the season. Park United, from Premier A, made it to the semi-finals where they were pipped by Kinsale. Park are determined to get back into the Premier itself and are certainly going the right way about it. The form of promoted team Glenthorn Celtic has been surprising. Troy Falvey’s Dublin Hill side are currently in second spot and showing every sign of being in the shake-up for the two promotion places. St John Bosco's’ have had a steady start to the season and are well placed in third. The likes of Coachford, Macroom and Togher could well come into the reckoning if they make full use of their games in hand. If not, they could find themselves in a battle to avoid relegation. Three teams go down from this division and already Springfield and Fairhill are on the slippery slope. Dripsey Celtic have unbalanced result, some very good wins and some poor defeats. It is a bit early yet but that leaky Dripsey defence (16 against in five games) in front of Raymond Moynihan could cost them dearly – unless running repairs are made. AUL 1: Mick McAuliffe’s Richmond continue to lead the way in Murphy’s stout AUL 1. McAuliffe’s forte over the years has been scoring goals but it is the improvement in the Richmond defence that has boosted their title hopes. The Waterfall side are conceding less than one a game. Very impressive indeed when compared with Albert Rovers whose leaky backline let in over two each match. Alberts also have a reasonably high scoring rate and hold fourth position at present. Glenvale have the worst defence in the division and are bottom and look certain to take the drop. Hibernians were the August tip to bounce straight back to Premier A but that will hardly materialise for Willie Ashman’s team. They are still reasonably well placed and can’t be ruled out. 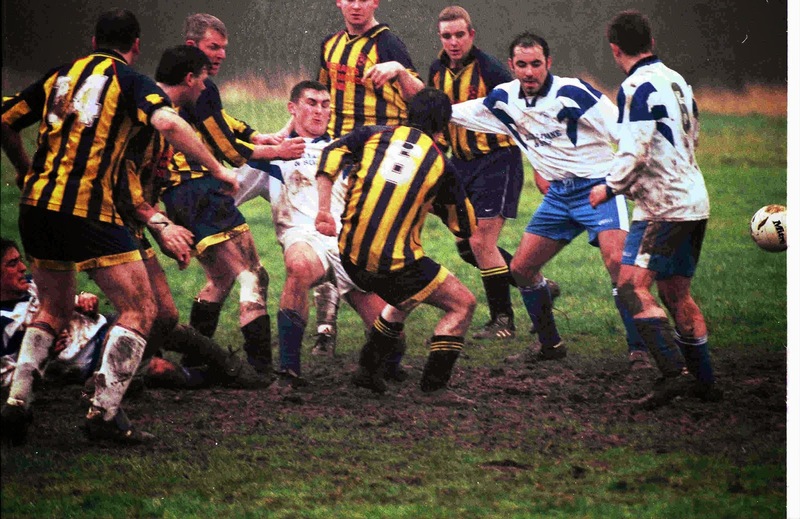 Pat Bowdren's Wilton Utd are perhaps the new favourites. They have won their four games to date but cup runs have seen them accumulate quite a backlog and that could handicap their title bid. Indeed, the chase is quite open and any team putting a decent run together in the coming months could do damage. Wilton and Hibs certainly have the potential as do Lakewood, UCC and Ballincollig. Don’t rule out Richmond hanging on at that top, particularly if McAuliffe and his assistant Gerry Williams can keep that impressive defensive record going. AUL 1A: Back in August, Blarney Street Athletic and Northvilla were tipped to have a big impact in the title race for AUL 1A and they are currently second and first. However, top tip Mallow are languishing in mid table, not out of it yet but showing precious few signs of getting back up to challenge the promoted pair. Buttevant, Ballyvolane and Rathcoole are all playing steadily enough and all will have their say but, on past form, are unlikely title winners. Churchview Celtic though are the team that could get up to trouble the top two. Eddie Morey, Micky Geaney, Luke Mannix and company have had a great run to the open stages of the FAI and, with that now out of the way, can concentrate on making up points and catching up. Churchview, who have the evergreen Finbarr Redmond in goal and the experienced Thomas Long scoring regularly, have played six in the league and have a one hundred per cent record. Seventeen for and just four against speaks volumes for the contributions of Redmond and Long and spells out quite a warning to the rest of the promotion seeking pack. Could be a very close finish yet but it could be Churchview’s turn this time. AUL 1B: Mayfield United, managed by Declan Keane and Tony Carroll, were the August tip for AUL 1B and they are still very much in contention but, because of good cup runs, have built up quite a backlog and have five less games played than unbeaten leaders Leeside. This is a ten team league and Gary Tobin’s Leeside, with 11 games played, are in a very strong position and will fight all the way to retain that top spot and much will depend on their head to head clashes with Mayfield and Leeds, about the only two sides with realistic hopes of catching the Little Island based outfit. It will be hard to dislodge Leeside. AUL 2A: August tip Millstreet Celtic just haven't been able to get it together consistently in 2A and are out of the reckoning, maybe. They are in 7th place but just seven points behind leaders Donoughmore and have a game in hand. This is shaping up to be a blanket finish as just about every team, aside from bottom two Coachford and Ard-na-Laoi, has a chance. Saxone Cup semi-finalists Glanworth will be the slightest of favourites at this point. Ger, whose assistant is Andrew Styles, has nothing but praise for current leading strikers Ciaran Speight and Damien Whelton but has a warning for the other teams: “Watch out. Eoin Sheehy is back”. And everyone in football, including his rivals, will wish Eoin all the best on his return from that long absence. AUL 2: Dave O’Mahony’s Ballyphehane Celtic were the August tip for the top in AUL 2 and, while they are a long way off it at present, they are the clear and present danger to all title pretenders in the division. O'Mahony’s boys are unbeaten but then so too are current leaders City Wanderers, determined to make up for last season’s near miss. Lee Rangers, not regarded too highly in that August preview, are also very much in the running as are Togher Rovers. It’s tough at the top here and will get tougher as Ballyphehane begin to draw closer. AUL 2B: Promoted UCC have shown little of the drive that won them the 3B title last season and the August favourites won't feature in the title race this time in 2B. Glen Celtic and Ballyvolane were also on that August shortlist and they have lived up to the billing and hold the top two positions. Promoted teams Hibernians, managed by Paddy O'Mahony, and Village Utd, managed by Denis Murray, are doing very well indeed. Passage, Bohemians and Knockraha are all in mid-table but are not that far off the pace and a few wins could see them rekindle their title ambitions. Glen though are the slight favourites, even if they have some difficult local derbies to negotiate. AUL 3: Kilreen Celtic were the start of season tip to do the business in AUL 3 and Harry McGovern’s lads are setting the pace in pole position. Carrigaline Utd and Tower Street Athletic are pushing the leaders and indeed the top three now could well be the top three in April. Kilreen remain favourites. After all, they have just eight games left and it is hard to see them relinquish what is quite a decent lead. AUL 3A: Newcomers Doneraile were the August tip for the top in a volatile mix in 3A and they are in second place, sandwiched between relegated sides Mallow Celtic and third placed Strand Utd. Again it looks as if these three will retain their top three placings right to the end but in which order? AUL 3B: Grattan Utd were touted as possible 3B champs in August but have disappointed in what is once again a very competitive division. Dillon’s Cross secretary Damien Wiley was confident ahead of the season and was expecting his side to have a big impact and that confidence has been justified as the Cross sit proudly at the top. While Dillon’s are well placed to win promotion, they will find it difficult to go up as champions as undefeated teams Central and Blackstone are better placed in terms of their points return from games played and it looks as if this duo will slog it out for the championship. Richie Keating’s Mayfield United team are leading the way in AUL Youths One and the others are playing catch-up. Tramore Athletic, who defeated Mayfield in the League cup final, are one side capable of doing just that but must wade through quite a backlog. Youths 1A is developing into quite a battle. Wilton currently hold top spot but there are at least six other sides in with a title chance. It is very early days yet in the U17 leagues as the teams here play just once every two weeks. Maymount Celtic hold the top spot in Division One and they, Cork City and Cobh Ramblers are definite contenders. Park United are setting a hot pace in One A with Mary’s and Kilreen also showing good form. Greenmount Rangers have had many great seasons but 1984/85 wasn't one of them. Indeed, Rangers were relegated at the end of it but that says as much about the high standard of the AUL Premier League at the time as it does about Greenmount’s weaknesses that particular year. Midleton and AOH joined Greenmount in the drop. Temple United won the league, with their great rivals St Mary’s in second place. That rivalry had boiled over earlier in the season during the area final of the FAI Junior Cup at Flower Lodge where referee Joe O'Keeffe sent off three players. Ten man Mary’s scored twice in extra time against their nine man opponents to reach the last sixteen on a 3-1 scoreline. Despite their poor league form, Greenmount came very close to making that FAI decider. They played a dreary scoreless draw with Mary's in the semi-final but surrendered an early goal to lose the hard fought Kilcully replay 1-0. Greenmount skipper that year was Harry Speight, a top class defender. Pat Cahill is still involved with the club while Alan Ramsell was another who gave long service to Greenmount. John Lyne, now a referee, managed Greenmount in the mid nineties. Keeper Ger McGreevey, who you'll find nowadays looking after Greenwood schoolboy teams, played with quite a few clubs while Neil Hannigan, Ber Tobin and Timmy Hewitt all became involved with neighbours Dunbar Celtic in the following years. Speight, Cahill, Ramsell and Mulcahy had all played for Rangers when they lost the 1980 AOH final to Bosco's. GREENWOOD A are looking for a friendly next Sunday (Home). Additional Youth League Fixtures due to cancellations of youths inter league game. Do you want to be in the running for the Murphy’s Irish Stout Team of the Month for December? 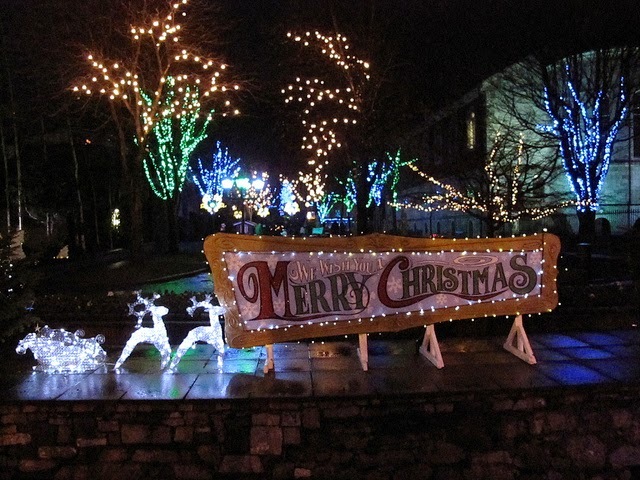 Get your entries in to Henry Healy, 19 Inniscarra Road, Fairhill, before Friday, January 9. Corinthians Athletic became the first AUL side to qualify for the last 32 of this season's Guinness FAI Junior Cup by beating Donegal visitors Clonmany Shamrocks 2 - 0 at Corinthians Park on Sunday morning. The homesters scored early in each half on their way to a well deserved victory. Clonmany ought back well after the first reverse and Corinthians owed much to the performance of keeper David Soden. True, he made the odd error in the difficult conditions but even managed to retrieve the ball on those rare occasions. The losers also tried hard after the second goal but Corinthians defended comfortably enough for much of the second period and had their own chances on the break. Corinthians had the first of the chances and Damien Huggins had a good early effort drive saved. In the 11th minute Gus Bowen, winner of the man of the match for Wilton in the 1987 AOH Cup final triumph, fired in a rocket. Peter Devlin dived to his left and conceded the corner. That flag kick as half-cleared and came to Colin Hill on the right. His cross unhinged the defence and Caleb Sheehan arrived at the near post to head home a beauty. The Donegal visitors showed their teeth in the 14th minute when a powerful long range free kick by centre half Sean Devlin flew just wide. Midway through, Martin Kavanagh latched onto a long through ball but ran out of angle and his show towards the near post was easily saved by Soden. In the 23rd minute, Soden blocked another long range special by Devlin but failed to hold the ball. It fell kindly for the incoming Stephen Harkin but Soden spread himself well and made the block. Soden was kept busy at this stage. In the 35th minute, he made a sound catch from a good effort by Robert McLaughlin. Three minutes later, Cavanagh came in at the end of a sweeping Clonmany move and let fly from the right hand side of the box but Soden showed strong hands as he turned the power-packed drive behind by his near post for a corner. The Donegal side had a grip and were expected to give Corinthians a torrid second half. But that grip was considerably loosened, that threat considerably reduced, when the home lads scored less than two minutes after the resumption. Hill's cross from the right should have been cleared but Clonmany allowed it across the goal and the alert John Turner stretched out a leg and turned the ball into the net via the post. Clonmany needed an early reply and were ever so close in the 55th minute when a free rebounded inside the Corinthians goal area. It finally came to Cavanagh but his close range flick was too high. It was to be their clearest chance of this period and they never exerted the kind of pressure evident in the second quarter. Indeed, the better second half opportunities were created by the winners and they came within inches of a beauty in the 69th minute. Sub Frank Giltinan did well to hold the ball up and lay it off to Turner. His cross from the left hand touchline sped into the box and Damien Huggins beat his man to it but the cross was centimeters too high and continued on across the face of the goal. Corinthians came close again two minutes later. Giltinan forced a corner kick. It was taken by Bowen and he found Martin Burke but his far post header wasn't a serious threat. The home side then survived three Clonmany corners before finishing strongly. Hill saw his 86th minute shot deflected just over the top and, in the final minute, Hill linked with Bowen but his shot off the return was wayward. Corinthians Athletic: Dave Soden, Harry Cripps, Paudie Dennehy, Paul O'Callaghan, Martin Burke, Gus Bowen, Damien Huggins, Colin Hill, Caleb Sheehan, Fintan Smith, and John Turner. Subs used: Mick Flynn for Dennehy (56th minute, injured), Frank Giltinan for Sheehan (62nd), and Colm Motherway for Smith (80th). Clonmany Shamrocks: Peter Devlin, Michael Bradley, Eamonn Reidy, Don McGonigle, Sean Devlin, John Harkin, Stephen Harkin, Robert McLaughlin, Paul McLaughlin, Martin Cavanagh, Eddie Doherty. Subs sued: Sean Doherty for Reidy (66th minute) and Colin Doherty for McGonigle (76th). * Blarney Utd suffered their first defeat of the season and lost 2 - 1 away to Shamrock Boys of Bray. All the goals came in the second half. Raymond O'Leary worked his way through for a beauty to put understrength Blarney in front but Shamrocks came back and took their place in the last 32 with a late disputed winner. Paul Fitton, Declan Twomey, and Carl Browne, stood out for the losers. * While the two fifth round games were completed, the three fourth round matches did not take place because of the bad weather. Bandon v Hibernians, Pearse Celtic v Rockville, and Kinsale v Glenvale, will have to be re-scheduled. Fairhill Utd, 4 - 1 up at the break, went on to defeat Dripsey Celtic 4 - 2 in the Murphy's Stout AOH Cup. Colin Murray was the hat trick ace for the 'Hill and he opened the scoring with a beauty; from the half-way line, he worked his way past three defenders and then rounded the keeper. He added another two, one a glancing header, the other a tap-in, and then a cracking free kick by Michael O'Sullivan yielded number four. There would have been a late fifth but a thundering shot from John McCarthy came back off the bar. Keeper Rory Curtin and full back Wayne Bullman stood out for the winners. Innishannon's luckless season in AUL 2 continued with a 3 - 1 home loss to Killowen. Seamus Lyons opened Killowen's account when he scrambled the ball home after the Innishannon defence failed to clear a free kick by sweeper Karl Murphy. Innishannon had their chances in the first half and Killowen's Billy Reidy made a couple of goal-line clearances. Besides, keeper Eamonn Murphy and sweeper Karl were in impressive mood. Visitors Killowen registered number two when Stephen Daly helped Martin O'Brien on his way. Innishannon kept battling and pulled one back in the 85th minute when Carroll Daly converted a penalty after a foul on John Burke. But there was an immediate reprisal as Barry Casey soloed away for Killowen's third. Michael Crowley and Jeremy Hurley played well for the losers, keeper Eamonn Murphy, Billy Reidy, and sweeper Karl Murphy for the winners. The Murphy's Stout Match of the week lived up to its billing but home side Park Utd lost the lively encounter in Murphy's Stout AUL 2A 4 - 2 to Glanworth Utd. Keeper James McNamara and Adrian Walsh impressed for the homesters. Glanworth went head when John Paul Cotter scored after a corner kick. Park missed a great chance of an equaliser before the break when Karl Burke's shot rebounded off the posterior of colleague Tadgh O'Connor. The equaliser came early in the second half, Mike O'Donnell on target after a John McNamara pass. But Glanworth then took over. Cotter restored their lead, Pat Quirke added a gem, and Pat Barrett, made it 4 - 1. Park kept plugging away and pulled one back when Walsh scored from a penalty awarded for a foul on O'Connor. Ballintotis, 2 - 1 up at the break, went on to defeat Bohemians 5 - 1 in Murphy's Stout AUL 2B. Willie O'Brien was a hat trick hero for the winners. His opening goal was probably the best; the opening was created by Sean Carr's great cross and the finish was top notch. Paul Barry and Jim Deane also netted for the rampant winners whose tops were Kevin Barry, Sean Carr, and Tom Kelly. John Byrne and scorer John Cronin did well for the losers. Before the game, a minute's silence was observed as a mark of respect to the late Paddy O'Regan (Bohemians). The top of the table clash here ended in a 3 - 1 win for leaders Northvilla over second placed Corkbeg. The Beg took the lead when Dan Kenneally scored but man of the match Stephen Hurley worked his way past three defenders and then beat the keeper to make it 1 - 1 at the break. Late second half volleys by Liam Dennehy and Ger O'Brien earned Villa the decision. Brian McCann and Ger Melville played well for the losers. Ardmanning Celtic, leaders in Murphy's Stout AUL 3, stretched their unbeaten league run to thirteen with a 3 - 0 win over title rivals Bellmount Rovers. 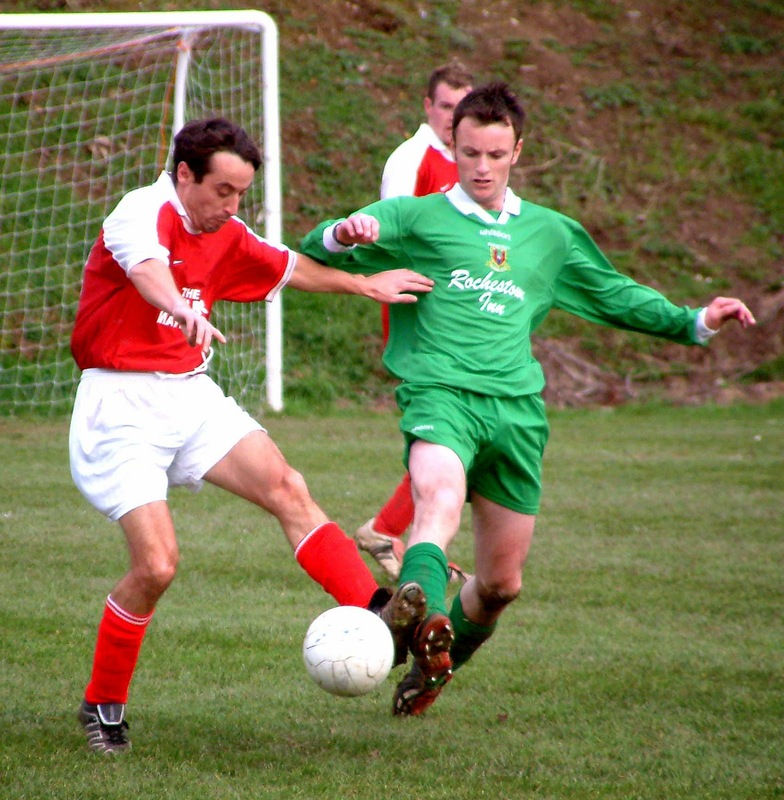 Keeper Peadar Gorman and midfielder Kevin Cummins stood out for the winners, Barry Fitton and Nigel Daly for the Rovers. Right full Michael Carey put the winners in front with a long range special and Denis Hayes made the half-time score 2 - 0 with a great header off an Alan Brown cross. A smashing solo goal by Colm O'Leary completed the scoring. President's Cup finalists Doneraile were back in league action on Sunday and had to pull out all the stops to get a 3 - 3 draw with visitors Donoughmore Athletic in Murphy's Stout AUL 3A. First half goals from David Murray and Michael Sheehan had the visitors in front. Doneraile, prompted by midfielder Dave Ryall and the O'Brien wingers, brothers Billy and Eddie, got a grip after the break and pulled one back through William Carey. Doneraile kept applying the pressure and centre half Dave Donellan was unlucky not to score. The deserved equaliser came when Ryall touched home a cross by John McAuliffe. But Donoughmore weren't finished. They bounced back and Murray struck again to put them ahead. Now it was up to Doneraile and they showed true grit and took a point when David Walsh equalised with two minutes to go. Second placed Newmarket Town suffered a 2 - 1 reverse away to Glanworth United. All the goals came in the opening half. Damien Walsh soloed through for the Glanworth opener and Bob Sheehan equalised, scoring from a spotter after a foul on Colin Stack. Paul Crowley then first timed the ball to the Newmarket net off a cross by Tom O'Flynn. The losers piled on the pressure in the second half but Glanworth, with Patrick O'Brien and Sean O'Connell outstanding, held on well. Sheehan was man of the match for the losers. The Hewitt brothers were the stars of the show as Dunbar Celtic surprised inform Tower Street Athletic 5 - 2 in a ding dong battle in Murphy's Stout AUL 3B. Richie Hewitt grabbed a hat trick, brother Timmy a single, and another veteran Tom O'Leary was also on target for the winners who came back after Mick Fielding had put Tower Street ahead. Sean Walsh, Ber "Thunder" Tobin, and Chris O'Sullivan, all played well for the winners while Murt Holland and Niall Greaney (scorer of their second goal) did well for the outgunned losers. Player-manager James Jordan put his boots back on and guided Passage to a 5 - 1 win over Village, thus ending a series of reverses. Jordan got on the scoresheet as did Gavin O'Connor (2), Kevin O'Rourke, and Martin Murphy. Pat Andrews and O'Connor were in top form for the winners. Ger O'Donovan scored a hat trick as he helped Douglas Hall ousted favorites Temple Utd from the Murphy Youth Cup on a 3 - 1 scoreline. Barry O'Shea, and Damien O'Callaghan, were others on song for the winners, now through to the semi-finals. O'Donovan was on full alert and was ready when Joe McSorley's 35 yard free kick crashed against the bar in the 10th minute. O'Donovan pounced as he did again in the 35th minute when the Temple keeper parried Derek Bowen's 25 yard free kick. Temple had the wind and slope in their favour in the second half but were badly hit when Douglas broke away with about 20 minutes to go. Bowen led the raid and let fly; again his shot was parried and again the pieces were picked up by O'Donovan. It stayed at 3 - 0 until the closing minute when Temple got their consolation. The Youths and Under 17 programme was severly hit by the bad weather and just one game was played in Youths Premier and here Leeds came back to draw 1 - 1 with Midleton after a scoreless first half. Duncan McCarthy put Midleton ahead in the 63rd minute and five minutes later Jonathan Cooney grabbed the equaliser after a terrific pass by Anthony Buckley. 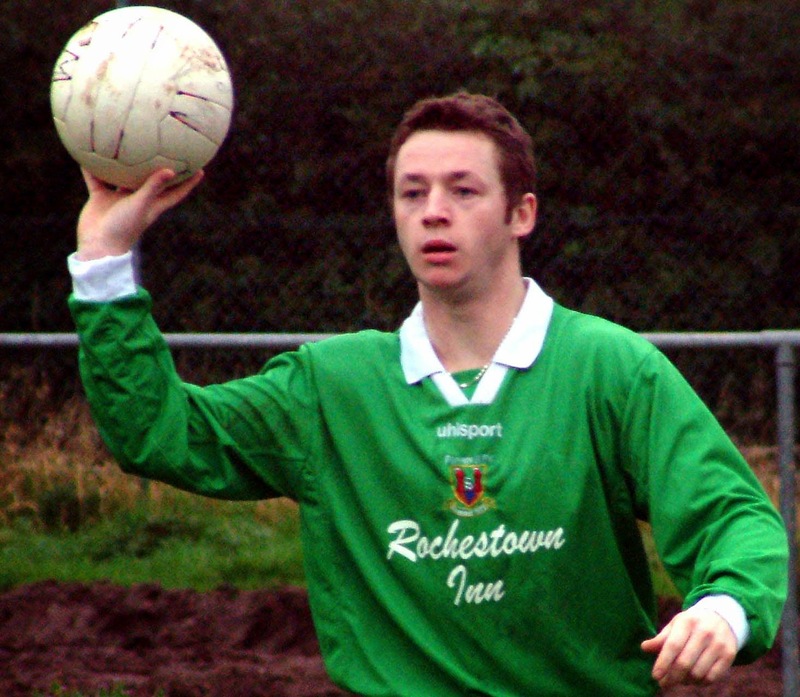 Keeper Stephen Nolan and midfielder Buckley were top players for Leeds, Michael Kenneally, Aidan McSweeney, Robert O'Donovan, and Stuart Costigan, for Midleton. Just one U17 game survived and here visitors Dunbar drew 3 - 3 with Crosshaven. Well done to Mick Dalton and to his young crew at Albert Rovers, the third division outfit who have just been voted the Murphy's Stout AUL Team of the Month for November. 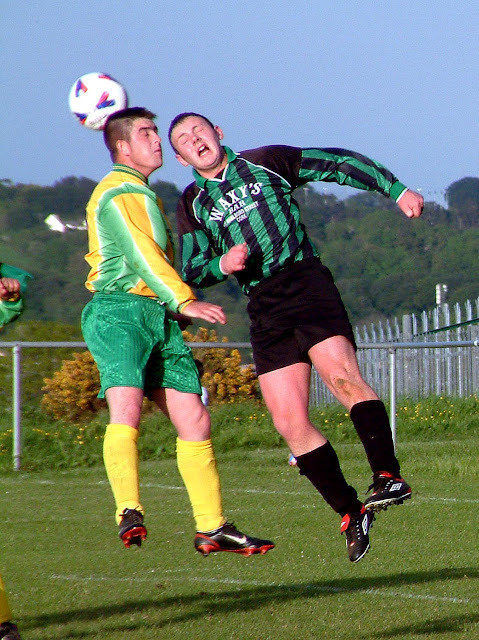 New fixture, Saturday next, 2.00, Munster Junior Cup - Tramore Athletic v Maymount Celtic, Tramore park, MSL. Blackpool v Maymount is cancelled, Blackpool v Castleview is confirmed. Hillington v Glenvale is the Murphy's Stout Match of the Week. Holiday fixture schedule: it is intended that there will be no games on the Christmas weekend; there will be matches, including U17 on the following Friday, no games on the 1st, a full list (including U17) on the 2nd, none on the 3rd. Murphy's Stout AOH Cup (remaining 4th round and 5th round qualifiers): Buttevant; Kinsale v Grangevale; Rathcoole Rovers; Castle Celtic or Macroom v Tower Street Ath; Bandon A v Mallow Celtic B; Springfield v Donoughmore Ath. A or Hibernians A; Togher Rovers v Millstreet Celtic; Strand Utd; Killumney Utd v Rockville; Blarney Utd A v St John Bosco's B; Glenvale v Fairhill Utd; Glencairn Celtic; Maymount Celtic; Blarney Street Ath. v Dillon's Cross; Ballincollig A v Greenmount Rangers or Coachford; Leeside A.
Murphy's Stout Saxone Cup (5th round): Rathcoole Rovers or Evergreen v Fairhill Utd; Glenthorn Celtic v Donoughmore Ath. or Millstreet Celtic or Strand Utd. 4 Glanworth Utd or Hillington B v Ardmanning Celtic or Village Utd A; 5 Greenwood or Donoughmore Ath. B v Hill Celtic A; 6 Brooklodge Utd v Mayfield Utd; 7 Glencairn Celtic v Rylane Celtic; 8 Mallow Celtic A v Corinthians Ath. Rockmount or Ballincollig v College Corinthians. Winners go into last sixteen nationwide. FAI Youths Cup (4th round, Cork area): Cork City v Ringmahon Rangers or Cobh Ramblers; Everton v Tramore Athletic; Springfield v Wilton Utd. Winners go into last sixteen nationwide. FAI JUNIOR CUP (5th round, Cork teams in open draw): Glenvale or Kinsale v Sky Valley Rangers; Arklow Town v Hibernians or Bandon; Rockmount v St Mochta's; Rockville or Pearse Celtic v Beggsboro or Edenmore. Extra time and penalties in above games; winners join Corinthians Athletic in the last 32. Murphy's Stout St Michael's Cup (5th round): Temple United or Grangevale v Maymount Celtic; Fairview v Kinsale or Blarney Street Ath. Murphy Youth Cup semi-finals: Everton/Coachford/Dripsey Celtic v Grattan Utd/Leeside; Ballincollig or Casement Celtic v Douglas Hall. The Cork AUL youths were the best in Ireland in 1979/80. Tramore Athletic won the Munster and FAI Youths Cup and the AUL won the FAI Inter-League title. Terry Kearns (from Youghal) scored a last minute extra time winner for Cork against hosts Kilkenny in the inter-league final. Terry had also scored Cork's first half equaliser in this thrilling match. The Cork team was: Hogan (Ballincollig), O'Sullivan (Casement Celtic), Begley (Everton), O'Keeffe (Rockmount), O'Donovan (Tramore Ath.) captain, Madden (do. ), M. Murphy (do. ), L. Murphy (Wilton Utd), Kearns (St Martin's), K. Murphy (UCC Academicals), and O'Connor (Casement Celtic). Subs used were Long (St Mary's) and Lyons (Ringmahon Rangers). Team coach was D. Glavin. Tramore also needed extra time to beat Home Farm 2 - 0 in the FAI Youths final at Turner's Cross, the goals scored by Dave Barry and sub Mick O'Rourke. The losers had beaten Springfield in the semi-final. 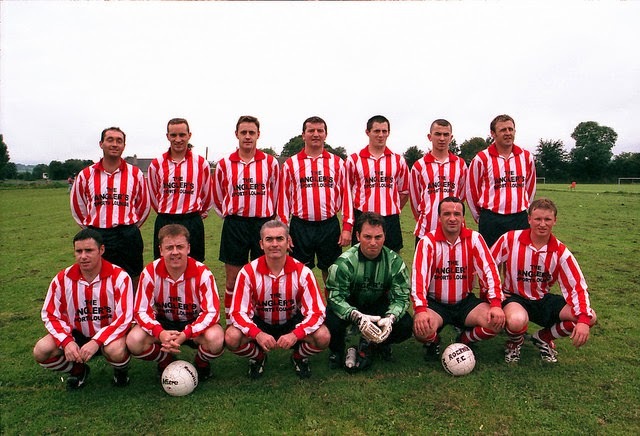 Tramore Ath: Cunningham, Smith, O'Donovan (captain), Madden, Waters, Murphy, Barry, White, O'Regan, Dineen, and Clare. Subs used were O'Rourke and Leahy. The Cork AUL juniors were beaten in the semi-final of the Oscar Traynor Cup. The team that beat Dundalk 3 - 1 in the quarter-final was: A. McCarthy, D. Deveraux, M. Tobin, R. Bickerstaffe, P. Healy, V. Marshall, D. Bennett, L. Naughton, S. Hurley, B. Mulcahy, and P. Foley. Subs used were J. Daly and J. Lonergan. Ballincollig defender Pat Healy (whose son now plays with Glasgow Celtic) was named on the Irish panel for a junior international against Scotland in October. Later in the season, 17 year old Finbarr Hogan (also of Ballincollig) was the only Cork player named in a 16 member Irish Under 17 panel to play in an April tournament in France. Other players in the squad were Jim Beglin (later with Liverpool) and Gary Howlett (later with Bournemouth). The AUL Premier League consisted of Castleview, Midleton, St Michael's, Casement Celtic, St Mary's, Douglas Hall, Bohemians, Cobh Ramblers, Greenmount Rangers, Hibernians, and Wembley. Ard-na-Laoi had a great season, winning both the League and Saxone Cup. Jamesie O'Leary netted four as they hit a club record in defeating Gunners 10 - 1. That win was in an unbeaten run that ended at the 22nd game when they were beaten 4 - 2 by Skibbereen Dynamoes in the quarter-final of the Third Division League Cup. The O'Dwyers of St Michael's (Tipperary) were in scoring form in a 6 - 2 win over Greenmount Rangers: John got a hat trick, Eddie hit two goals, and John Joe contributed one. Another early season hot shot was Anton Sweeney who scored seven for Bosco's in a 9 - 2 win over Newcastle. 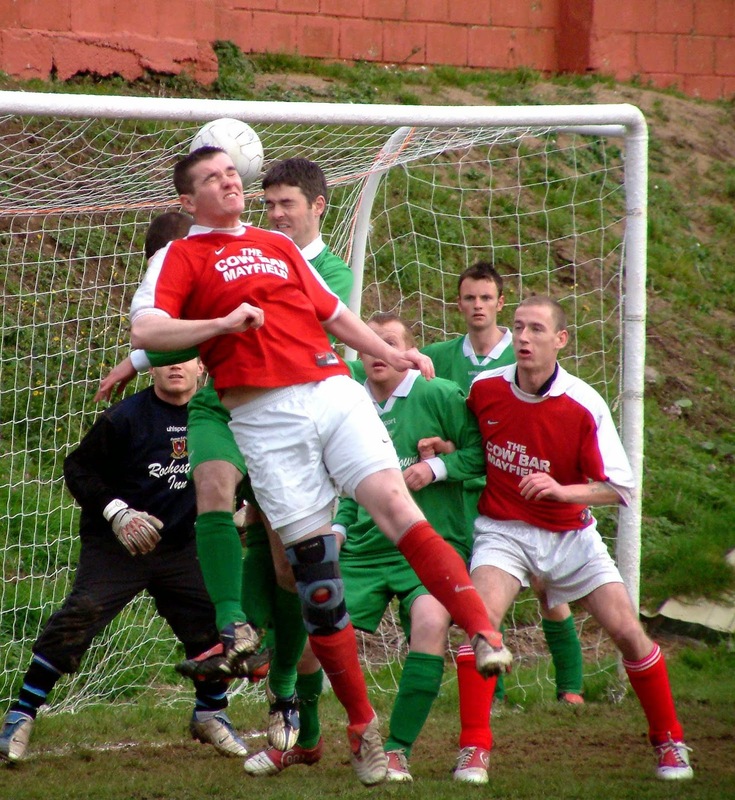 In October Brian Coughlan notched a hat trick of penalties as Ballincollig whipped Macroom International 7 - 0. A week later, Gerry Horgan of Bweeng did the same in a third division match against Buttevant. Two months later, Bweeng bagged the highest score of the season when they beat Glenville 14 - 2. Finbarr Redmond kept two clean sheets on October 27th. The first was in a minor match against Dunbar Celtic and the second in a Premier League match against Douglas Hall. Another keeper in good form was Terry Furlong of Bohemians; he saved two penalties as Bohs beat Michael's 2 - 0 in the league. The major local trophy, the AOH Cup, was won by second division St John Bosco's who beat Greenmount 2 - 1 in the final at Turner's Cross. All the goals came in the second half. Skipper Ger Glavin netted twice for the Bosco's while Pat Mulcahy converted a penalty for the losers. The Bosco's team was: Tony Horgan, Sean Barry, Dec Barry, Kevin Barry, Denis McSweeney, Joe Hartnett, Ger Glavin, Anthony Aherne, John Clery, Billy Aherne, and Anton Sweeney. Subs (not used) were Kieran O'Donovan and Paddy O'Sullivan. Casement Celtic won the Premier League. Their outstanding performer, in their first ever premier title, was centrehalf and team captain Ger O'Sullivan. The County Cup was won by Ballincollig after a penalty shootout with Carrigaline. The match itself had ended at 1 - 1, Martin Hogan (captain) scoring for the winners and Leo West for Carrig. Ard-na-Laoi beat unlucky Carrigaline in the final of the Saxone. The score was 2 - 0 and the marksmen were Brian Gaffney (penalty) and St John Cremin. The Leemount line-up was: R. O'Mahony, G. Casey, W. Keohane, B. Gaffney, G. Kavanagh (captain), D. Aherne, M. Horgan, F. Daly, J. O'Leary, A. Feehan, and St J. Cremin. Subs used: P. Casey and J. Aherne. Tramore Athletic won all the local youth trophies bar one. Rockmount took the spotlight here with a 4 - 0 win over St Mary's in the Murphy Cup, the goals scored by John Magee, Brendan Kenneally, Kevin Kearney, and Denis Keane. At the turn of the year, one of the great characters of local football, Michael Dennehy (of Northvilla), passed away. He had been a player with the old Central Rovers and one time a member of the MFA council. He was a selector of the 1966 Oscar Traynor side and enjoyed this sole Cork triumph in that competition. His fellow selectors were Billy O'Sullivan and Sam Allen (RIP). Carrigaline Utd took the coveted AOH Cup for the first time when they defeated Temple Utd 3 - 1 in the 1985 final. It was Carrig's first time in the final while Temple were making it a hat trick of losing AOH deciders. Ray Coveney was the hat trick hero for the winners and opened the scoring in the 16th minute when he tapped in a Paddy O'Sullivan cross. Three minutes before the break he ran onto a through ball and placed a low shot for his second. Just on half-time he directed a diving header to the net, the cross having been supplied by Paudie Coughlan. Temple exerted the greater pressure during the second half but their only consolation was Jimmy Brady's 63rd minute strike. Carrigaline had been badly hit by withdrawals in the run-up to the final and player-manager Kieran "Blondie" McGovern did a great job of re-oganising his depleted forces. This was the 34th AOH competition and Carrigaline were just the third county side to have its name engraved on the plinth. Previous county winners were Crosshaven (1952 and 1972) and St John Bosco's (1980). The only other non city winners were St Michael's (Tipperary) in 1971. Coveney's hat trick was the first since Davy Hayes got one for Grangevale in the 1978/79 decider. Carrigaline Utd: Mick O'Donoghue (captain), Arthur Twomey, George Meade, Eamonn Kelley (man of the match), John Gargan, Kieran McGovern, Paddy O'Sullivan, Jim Turner, Rory McHugh, Ray Coveney, and Paudie Coughlan. Subs: Eddie Forde for Coughlan (60 minutes) and Dave Molloy for McGovern (76 minutes). Temple didn't let the cup loss derail their challenge for the Premier League and they took the title with a final game 2 - 1 win over St Mary's who needed just a point. Temple's panel: Martin O'Sullivan, Danny Deveraux, Tony Kenny, Bertie Cullinane, Noel Cambridge, Austin Ricken, Frank Thornton, Johnny Deveraux, Jimmy Brady, Denis Keane, Denis Daly, Dommie Hussey, John Aherne, Brendan Coade, Anthony Ryan, and Mick Long. Farnanes took the title in AUL 1, Ballinlough Rovers in 1A, Mallow Utd in 1B. Western Rovers also booked a place in the Premier League by winning a three way play-off that also involved Ballyvolane and Waterloo. 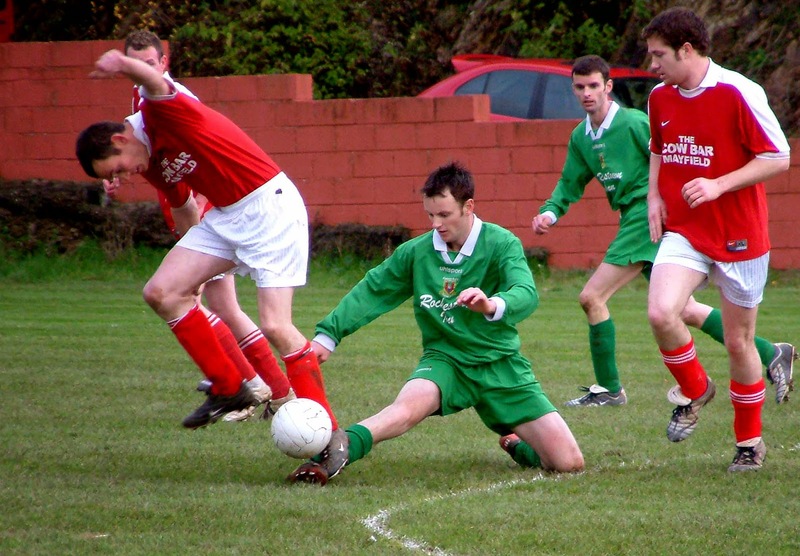 Douglas Hall had a season long battle with Carrigtwohill in AUL 2 and pipped the East Cork side for the championship. Crescent continued on the up by winning 2A while manager Barry Murphy and skipper Mick Walsh led Coachford to the title in 2B. Pat O'Neill got the goal that earned College Corinthians a play-off win over Tonyville and the title in AUL 3. Tommy Morrissey, Harry Foley, Liam O'Mahony, Peter Farrell, and skipper Michael O'Mahony, all played key roles as Kilreen Celtic won in 3B. Steve Yelverton coached newcomers Glen Utd as they topped 3A. Springfield win Youths 1, Glasheen beat Passage in a play-off for the title in Youths 2, while the 2A champs were Ringmahon Rangers. Cup winners from 1985: St Mary's (St Michael's Cup), Mallow Utd (County Cup), Mayfield Utd (City Cup), Avondale Utd (Saxone Cup), Leeside (President's Cup), Casement Celtic (Murphy Cup), St Mary's (Munster Youths), Springfield (Coca Cola), Passage (Second Division Youths Cup). 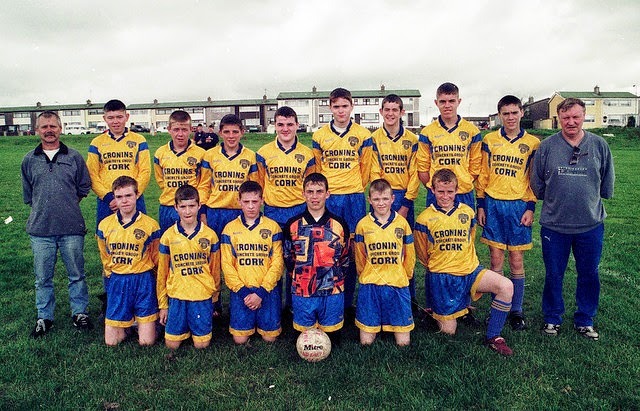 Nu-Farm U14s at the start of the 1999/2000 season, pictured at home to Ringmahon Rangers. Click here to see lots more pics from 1999.